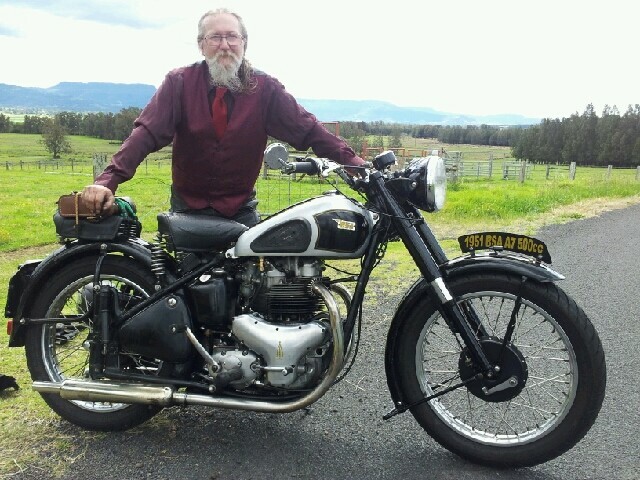 A forum member "lefty leif" was doing Tee shirts with BSA emblems. I got a couple. Haven't heard from him for about a year. I'll post on his topic to test the waters. i wouldnt mind one of those long factory brown warehouse coats with the forum logo on the breast. all the factory assemblers wore brown dustcoats and they would be great for autojumble rumaging and roadside repairs. I like the idea. I think having the design is the biggest step. As for printing, I think that may best be done locally, as in OZ, US and UK, since small-run shirt printing is readily available in the First World. I have a feeling the licensing fees for using BSA insignias are going to be small . Anyone interested in tackling the graphic art work? ...Anyone interested in tackling the graphic art work? With apologies to Mr Admin/e; perhaps the first step would be to design a distinctive logo for the forum. Just to get the ball rolling I've been playing around with Adobe Elements and come up with some possible logo/shirt designs. I don't really think the original, (saved from this site) is large enough to make a good enough quality image. That bottom one is a nice piece of composition, but I must throw a spanner in the works (does the figure of speech translate?) I have a t-shirt with a big design like that across the chest that I really like. I just cant wear it. The printing is done in vinyl ink and the vinyl doesn't breath, so it gets very hot and sweaty beneath the design. "not too many Tee shirt days in UK, sweat shirt would be nice tho"
Or how about a patch. I just had 100, 3" patches made for my club. Woven rather than embroidered (a lot clearer logo) and velcro backed for $7.57AU. 200 would be about $1AU each less. My club member also does most of the Australian Navy patches. I like the patch idea. Especially if the design can embody the global community that this forum represents. I like the patch idea. Yup, a patch would be great; it could be transferred to another shirt or whatever. Especially if the design can embody the global community that this forum represents. An image of the Earth with suitable text wrapped around it maybe? This would be great, of course. Anyone comes up with more ideas \ design, and we'll make a poll ? Here is an idea for a patch. Page created in 0.819 seconds with 19 queries.